News update: Fabriano 5 paper has had a slight texture change. This will be of interest to artists who choose it for its ultra smooth surface. 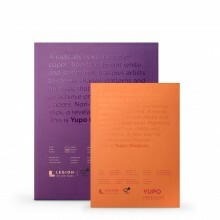 Fabriano 5 is an exceptionally smooth paper made by the Italian company Fabriano. This paper is both surface sized and watermarked, with the Fabriano logo. 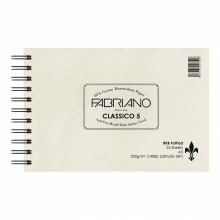 The Fabriano 5 paper is mould made from 50% cotton and 50% carefully selected raw material. The absence of acid to guarantees excellent permanence and resistance to ageing. This paper is designed for watercolour painting and lithography printing, but can also be used for tempera, charcoal, graphite, wax, and pastel. It is immensely popular product with watercolour artists and printmakers alike. Fabriano 5 paper has changed permanently because of changes to the machine that makes it. The surface texture is a bit less smooth and the sizing has changed slightly. The manufacturer does not believe the change is significant, they feel the paper is still within their allowed parameters. But a number of artists have found the change significant enough that it interferes with their work. They are usually artists who make very precise work and need to be able to control fine lines, so most often botanical artists using watercolour or coloured pencil. Since we have made customers aware of the changes to this paper, please be aware that if you wish to return the paper to us you will need to pay the postage costs for the return. Read our Blog Post for the full details.